This morning before the rest of the house was stirring, the pup and I headed out to the front yard to contemplate and do what doggies do in the morning dew. The yellow of the sun and the blue of the sky seemed a more brilliant color today, promising us a day of beauty and perhaps a cool breeze or two thrown in there. Meet Emilio, the new friend the sweet pup and I made this morning. I want to find his rhythm and grace in my own life. As we were headed back in, I saw this guy making his way down the walkway. I had already seen some of his kin whose demise had come all too quickly back on the pavement several feet away. This one still had some get up and go. As I watched his movements, it amazed me. His head would stretch out and move forward ever so slightly, and then he’d wait for the rest of his body to catch up. Again, stretch that head and wait. It was painstakingly slow to me, who must have seemed like a skyscraper had he looked up. Or, you know, had eyes. 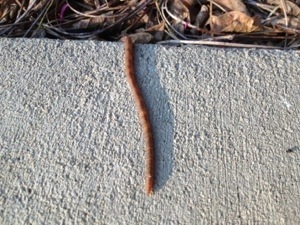 As I watched him it hit me that I could learn a thing or two from Emilio the Earthworm. He takes his time. (I wonder what an earthworm in a rush would look like anyway.) He leads with his head. Then he waits for the rest of himself to catch up. Wonder what he thinks about as that long body wiggles in and prepares to follow the head again? He has a lot of time for cogitating, I’m thinking. I tend to get ahead of myself a lot. And then not wait for the rest of me to catch up, just plunge right in on the next thing. And the next and the next, until I’m running in circles and find myself putting two entrees in the oven for the littles’ lunch (they did not complain on that) or I leave my wallet at home twice in three days (they did on this–Cooter was hoping for Chick-Fil-A that night–not without my wallet, buddy.) And so it is. My new author friend, Ann Hite, taught a Writer’s Workshop on Monday. She talked about the exercise of walking slow–how important it is to slow down. To listen, to think, to just be. Still. Slow. Quiet. That’s huge. I have been walking fast most of my life; it’s a short girl thing. It was especially true in high school when my ability to walk fast and dart through the throngs of students on the walkways between buildings determined whether or not I’d be on time for class and thus stay out of the Vice Principal’s office one more day. Then there’s that whole walking fast thing to burn energy, burn calories, lose weight, stay healthy. Our society is not one that emphasizes the benefits of walking slow. Or crawling in the case of Emilio. My Mama got it. She could get more done in a day than most folks do in a week or maybe a month. And yet she had her quiet times. I honestly don’t remember ever seeing her in a hurry. I don’t remember her ever saying, “Hurry up” or “right now!” or huffing and blowing getting out the door. She simply did not run behind. It’s a trait I admire as I did not inherit it. At all. I asked Sister if she ever remembered seeing Mama in a hurry. And she immediately responded, “Yes. I did. Once.” She was quiet. I asked her “when” about the same time the memory hit me. When Daddy was being transferred from the local hospital to Emory in Atlanta at the end of August in 2009, Mama went home to pack and Sister was there to help her. That is the only time either of us remember Mama being in a hurry. She had strong faith and peace. I wonder if her slow and steady pace helped with that. As I rose from my squatting position to go back in the house this morning I thought about all of this. I might need to tack a picture of Emilio on my mirror to remind me to slow down. Don’t let my mind rush ahead with dreams and goals and ideas. Slow down, listen, and wait. I feel calmer just breathing that. In and out. Slow down. Listen. Wait. I looked down at my new little guru and back at the sun that was getting brighter through the trees. Another little bit and that pavement would warm up fast. He didn’t seem to be headed toward the yard but instead in a line with the walkway. 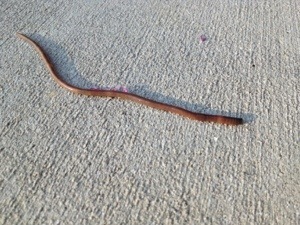 Y’all know what happens to earthworms on hot pavement, right? Very sad. I felt like one of those wildlife photographers. I know they are filming nature and have some sort of perhaps ethical something holding them back from letting the inevitable happen, but I could not bear to come back out in a couple of hours and find him baked on a 350 degree pathway. I took a leaf and helped him along until he started wiggling so much it reminded me these guys must be related to snakes. Ack! I left him to his own devices to finish heading into the dirt. One stretch and wait at a time. There he goes. Thanks, Emilio, for stopping by and teaching me the ways of the earthworm. May we all remember to let our bodies and souls catch up as we go through our busy, filled to the brim days–to slow down, listen, and wait. I think that will be my new breath prayer as the winds of fall and yet more changes blow through my days and I find myself overwhelmed. My friend taught us about breath prayers, an ancient practice that allows one to meditate through steady breathing and focusing thoughts. Walk slow, my friends. And soak in the good that follows.